The 365 days of 2018 is moving to another 365-day of the Year 2019, and it is the best opportunity for us to share the wishes for each other on the coming year. That is one of the reasons why every year, I take some minutes to write this new-year message for you. 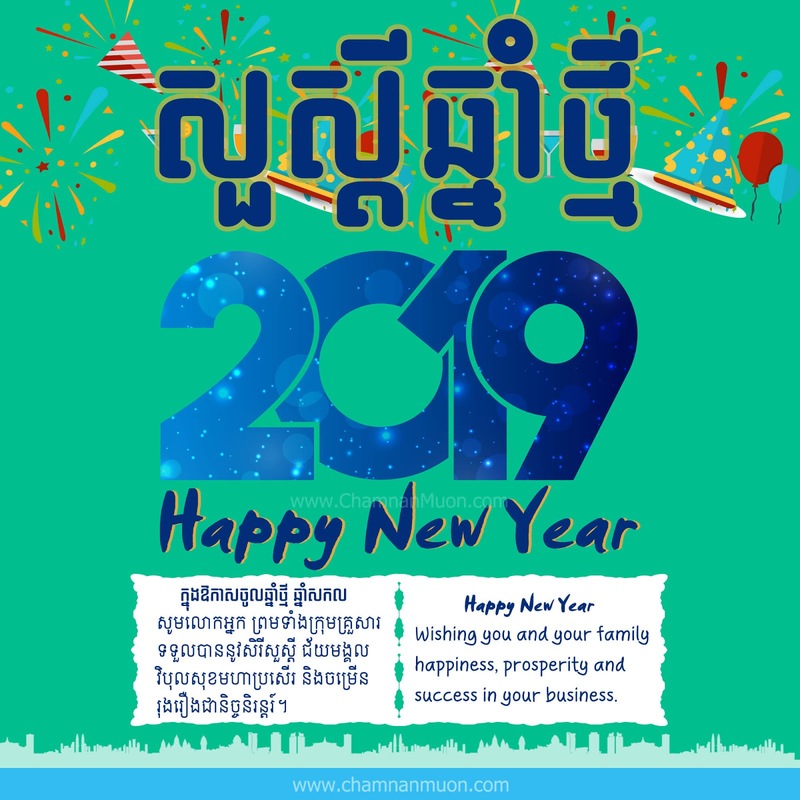 Please allow me to say 'Happy New Year 2019' (or Khmer language: រីករាយឆ្នាំថ្មី ២០១៩) to all beloved readers, friends, and families who have been reading my blog and supporting me so far. Taking this opportunity, I also would like to wish you and your family happiness, prosperity, and success in your business for the upcoming New Year 2019. Please, the Year of 2019 be blessed you all the best for the whole year through, and enjoy your New Year's Celebration together with your beloved ones!. Do you want this e-card? Get it here (Free to use without modification). I believe 'The New Year 2019 is the Best Year for everyone in the world'. What are your wishes and dream you want in 2019? where will you plan to celebrate it? Have something to wish? Kindly share your wishes below! This year, Khmer New Year 2018 will be celebrated on Saturday, April 14 to Monday, 16 April 2018. These three days called Maha Songkran for the first day, Virak Wanabat for the second day, and Virak Loeurng Sak for the final day. Based on beliefs, the Angel of the Rooster 2017 will transfer her duties to the Angel of the Dog 2018 celebrating on April 14, 2018. Taking this great occasion, I would like to say Happy Khmer New Year 2018 to all Cambodian people and the rest of the world and wish you all the best for the upcoming Cambodian New Year 2018 to all my friends, colleague, families, beloved readers, and people around the globe. Please, the Year of the Dog's angel wishes all be blessed with a peaceful and prosperous living for the whole year through. Every Khmer New Year, Cambodians those who come for study or work in Phnom Penh capital, they will go back to their homelands to have fun with their families, relatives, and friends. Watch more videos on the official Facebook page. Rikreay Chhnam Thmei! Have a nice holiday! So, where you plan to visit? Please let me know, and let share me your message or idea below. Another 365 days of 2017 is going to be replaced by the Year 2018, and it is the time when you want to wish each other on the coming year. That is one of the reason why every year, I take some mintues to write this new-year message for you. 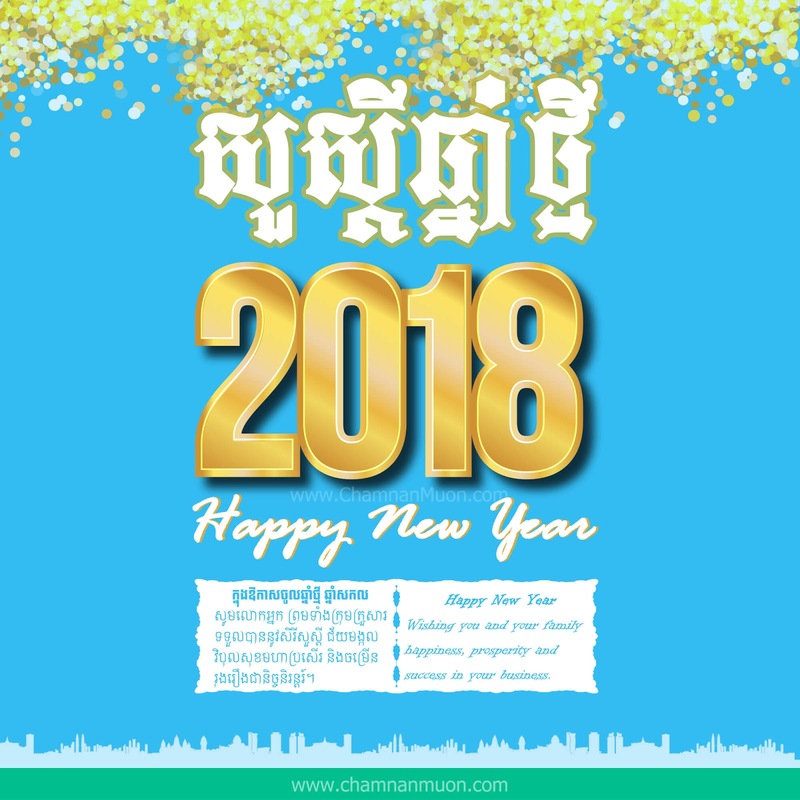 I am pleased to say 'Happy New Year 2018' or in Khmer language 'រីករាយឆ្នាំថ្មី ២០១៨' to all beloved readers, fans, friends and families who have been reading my blog and supporting me so far. Taking this opportunity, I would like to wish you and your family happiness, prosperity, and success in your business for the upcoming New Year 2018. Please the Year of 2018 be blessed you all the best for the whole year through, and enjoy your New Year's Celebration together with your beloved ones!. The New Year 2018 is the Year of the Dog according to Chinese zodiac. What are your wishes and dream for 2018? where will you plan to celebrate it? Have something to wish? Kindly share or drop your comment below! The time flies, the year 2016 will say good-bye to the new year of 2017 on December 31, 2016 at 11:59:59. That is why almost every year, I write this new-year message for you. Let say "Happy New Year 2017" to all beloved readers, my friends and families who have been reading my blog and supporting me so far. To take this occasion, I would like to wish you and your family happiness, prosperity, and success in your business for the upcoming New Year 2017. Please the Year of 2017 be blessed you all the best for the whole year through. Enjoy your New Year's End with your beloved ones together!. Need this e-card in higher resolution? Get it here (Free to use). Where will you plan to celebrate or visit for this New Year 2017? Have something to wish? Kindly share or drop your COMMENT NOW! Time is fast to move from one year to one year. The angel of the year of the Goat 2015 will transfer her duties to the angel of the Monkey 2016 that will be celebrating on April 13, 2016. To take this valuable chance, I would like to say Happy Khmer New Year 2016 to all Cambodian people and the rest of the world, and wish you all the best for the upcoming Cambodian New Year 2016 to all my friends, colleague, families, beloved readers, and people in the world. Please, the Year of the Monkey's angel wishes all be blessed with a peaceful and prosperous living for the whole year through. The holiday lasts for three days beginning on New Year's Day, which falls on April 13 this year, which is the end of the harvesting season, when farmers enjoy the fruits of their labor before the rainy season begins. Khmers living abroad may choose to celebrate during a weekend rather than just specifically April 13 through 15. These three days called Maha Songkran for first day, Virak Wanabat for second day, and Virak loeurng Sak for final day. Where Will You Plan to Visit? Temple trip: Siem Reap is the best place to visit temples such as Angkor Wat and biggest cultural event so-called Angkor Sankranta, and Battambang and Pailin are also under their considerations for a waterfall, mountain, and rice field views. Coastal/Seaside trip: Sihanoukville, Kampot, Kep, and Koh Kong – these are good choice to visit nice beaches, island, and fresh seaside. Nearby Phnom Penh City: Some of the people who has families in Phnom Penh, they consider to eat out nearby restaurants or visit the waterfall in Kirirom resort in Kampong Speu province, and sometimes they go to seaside trip too. Are you looking for a whole year of Cambodian public holiday 2016 or other ASEAN countries? If so, please check out this article. Angkor Sankranta is an event of Khmer New Year organized by the Union of Youth Federations of Cambodia (UYFC) which is held in Siem Reap province from 13–16 April. Angkor Sankranta is an opportunity for all Cambodians as a united Khmer Family and for foreign friends to receive unforgettable and exquisite experiences during Khmer New Year in Cambodia. Keep updates on the official Facebook page. What is My Message for This Year? Almost every year, I always keep some messages for myself as well as for my beloved readers. So, what is it? Keep doing goodness for society even it is not seen: I always tell myself that human is different so please don’t try others to be yours – just keep trying to solve a social problem for society. Others may not see what you have done good things for your beloved country but you yourself can see it. Never give up on what you love to do: It is true that people have to do what they love, so even though she or he faces any problems, they still keep trying. Sooner or later, you will get what you need. The message is still the message to keep thinking but the action is a must to do! សួស្តីឆ្នាំថ្មី Soursdey Chnam Thmey! Have a safe trip wherever you go! Do I miss any places or points not to mention above? Please share your idea below. Let say "Happy New Year 2016" to all my friends who are always reading my blog so far, and to take this occasion, I would like to wish you and your family happiness, prosperity, and success in your business for the upcoming new year 2016. Where will you plan to visit during this New Year 2016? Planning ahead is better than not even it is in short or long term. I think everyone will have one's own plan, especially for every new year coming, both personal and professional lives. Having a great plan is not enough if there is no any action, do you think so? SEE ALSO: Happy New Year 2015! Please the year of 2016 be blessed you all the best for the whole year through!. Enjoy your time with your sweeties during this year-end together!! "The New Year 2016, Year of The Monkey"
Have something to wish? Kindly drop your COMMENT NOW! Another year has come and gone, the time cannot wait for us and we also cannot call it back. The Angel of year of the Horse 2014 will transfer her duties to the Angel of the Goat 2015 celebrating on April 14, 2015. 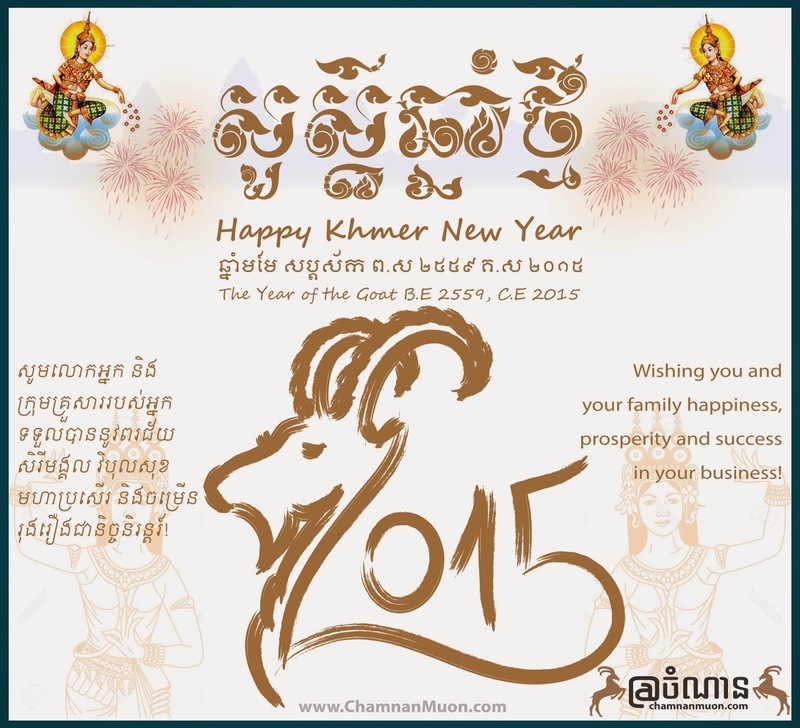 To take this opportunity, I would like to say Happy Khmer New Year 2015!! I wish all the best for the upcoming new year 2015 to all my friends, colleague, families, and my beloved readers! Please the Year of the Goat's Angel wishes all Cambodian and the world people be blessed with a peaceful and prosperous living for the whole year through. Cambodian or Khmer New Year aka Chaul Chnam Thmey in the Khmer language, literally "Enter New Year", is the name of the Cambodian holiday that celebrates the New Year. The holiday lasts for three days beginning on New Year's Day, which usually falls on April 13 or 14th, which is the end of the harvesting season, when farmers enjoy the fruits of their labor before the rainy season begins. Khmers living abroad may choose to celebrate during a weekend rather than just specifically April 13 through 15th. What are these three days called? Virak Wanabat is the name of the second day of the new year celebration. People contribute charity to the less fortunate by helping the poor, servants, homeless, and low-income families. Families attend a dedication ceremony to their ancestors at the monastery. T'ngai Leang Saka is the name of the third day of the new year celebration. Buddhists cleanse the Buddha statues and their elders with perfumed water. Bathing the Buddha images is the symbol that water will be needed for all kinds of plants and lives. It is also thought to be a kind deed that will bring longevity, good luck, happiness and prosperity in life. By bathing their grandparents and parents, children can obtain from them best wishes and good advice for the future. What is my this year message? Last of the happy-Khmer-new-year article, I always keep a message for myself as well as for my beloved readers. So, what is it? គិតល្អ និយាយល្អ ធ្វើល្អ និងចែករំលែកល្អ - Think Good, Say Good, Do Good, and Share Good. Doing Good is a state of mind that can accompany every action and shine through every thought. Doing Good starts from within, so even the littlest smile can change something in your life and make a difference in the reality of the people around you. So, Let’s Start Doing Good Deeds for Our Society Together! Please have a watch about this greeting card on Google Earth Pro (you wanna get KML file?)! 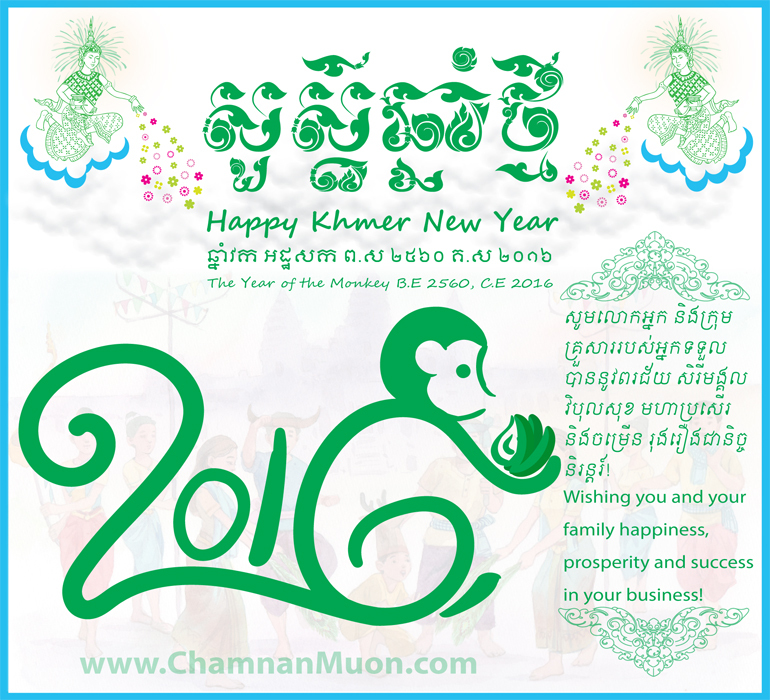 Let's Say Happy Khmer New Year 2015, and Please Enjoy the Holidays Together! 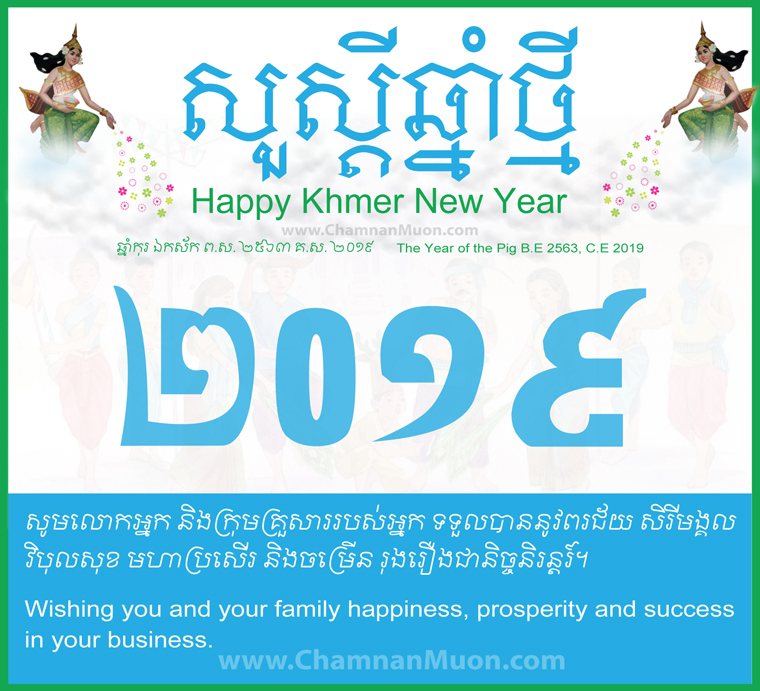 Happy Khmer New Year 2015! Let's say "Happy International New Year 2015!" to all my friends who are always reading my blog so far, and take this occasion I also would like to wish you a happiness, prosperity, and success in your business for upcoming new year 2015. Do you have any plan during the upcoming New Year 2015? I think everyone always has your own plans, especial for every new year both personal life (family, personal development, social contribution etc. ), and professional career/business (strategic plan, financial plan, implementation one etc.). Even we have those great plans but the important one is ACTION! Related: Happy International New Year 2014! Please the year of 2015 be blessed you all the best for the whole year through!. So, kindly enjoy our life with our sweeties during the year-end of 2014 together!! "The New Year 2015, The Year of Taking Action"
Do you have any wish to express? Kindly drop your comment below! Happy International New Year 2015! The time moves forwards very quickly, so how can we catch it and ask to wait for us on what the stuff undone to be finished, yeah actually we can't. The Angel of year of the Snake 2013 will transfer her duties to the Angel of the Horse 2014 celebrating on April 14, 2014. To take this opportunity, I would like to say Happy Khmer New Year 2014!! I wish all the best for the upcoming new year 2014 to all my friends, colleague, families, and my beloved readers! 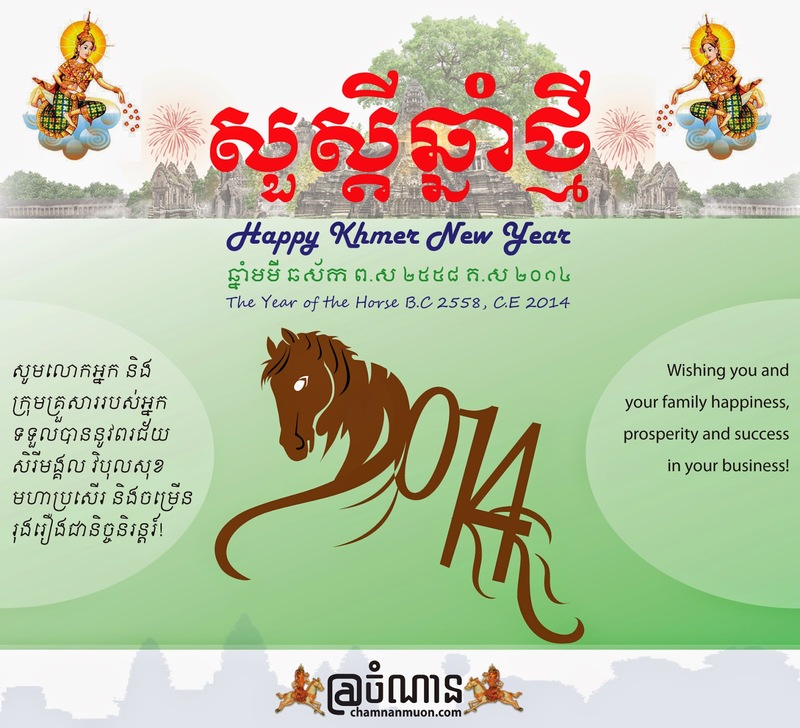 Please the Year of the Horse's Angel wishes all Cambodian and the global people be blessed with a peaceful and prosperous living for the whole year through. What is this year message for me? - IT + Non-IT knowledge: it is a MUST to learn both Information technology and non-IT knowledge in this Information Age while the globe leading by most technology industries, and social media tools are the key stuff. - Nothing Get without Invest: No anything is free for you, so you have to invest time or money to learn, share and earn especially to contribute back you to the society. - Love the GREEN: Think about our environment while the world faces global warming, so your contribution to save the things on what affect to it. Let's Enjoy Cambodian Holidays Together! Happy Khmer New Year 2014! Let me say "Happy International New Year 2014!" to all my friends who are always reading my blog so far, and take this occasion I also would like to wish you a happiness, prosperity, and success in your business for upcoming new year 2014. This is my third wishing cards since previous years. Do you have any plan during the upcoming New Yea Eve? I think everyone always have your own plans, especial for every new year both personal life (family, learning, social contribution etc. ), and professional career/business (strategic plan, financial plan etc.). Back to the happy points, there are many places in Cambodia you could manage your holiday times to celebrate with your families or sweeties such as in Phnom Penh, Kampot or Kep, Kampong Som or Sihanouk Ville, Siem Reap, and Mondulkiri etc. So, kindly enjoy our life joyful with our sweeties during the year-end of 2013 together!! "The New Year, The Year of Revolution"
Happy International New Year 2014! 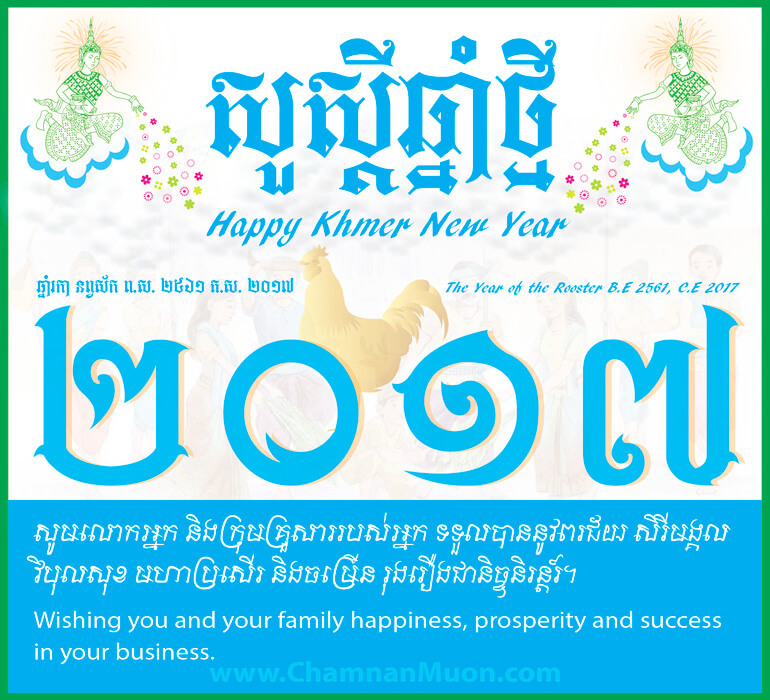 Happy Khmer New Year 2013!! I wish all the best for the upcoming new year 2013 to all my friends, colleague, families, and my beloved readers! 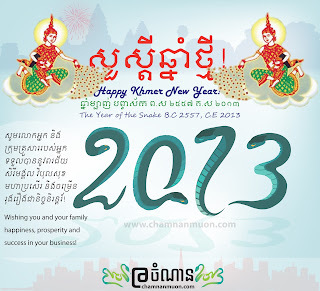 Please the year of the Snake wishes all Cambodian and the global people be blessed with a peaceful and prosperous living for the whole year through. What was my last year, 2012, phrase? "Think Positive, Do Positive, and will Get Positive!" What is a phrase for this new year, that's the Year of the Snake? Personally, I do love it and it's so important not only for personal but also for organizations to do. So do I practice it yet presently? Yeah, I can say I am starting to use it. What is it so? Let's practice it to keep continuous improvement (Kaizen)!! Are you ready to celebrate it with your family and friends? 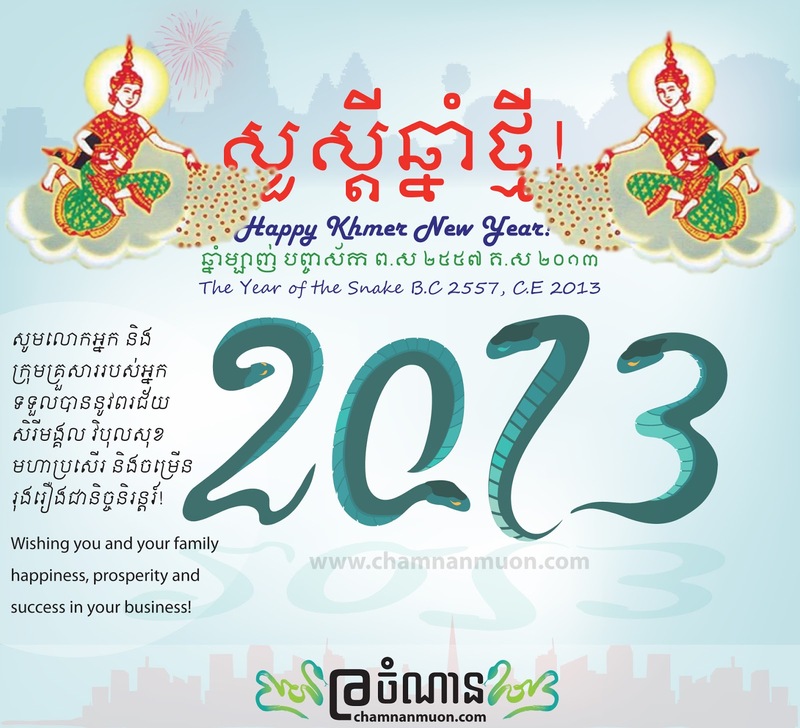 Happy Khmer New Year 2013 - Year of the Snake! 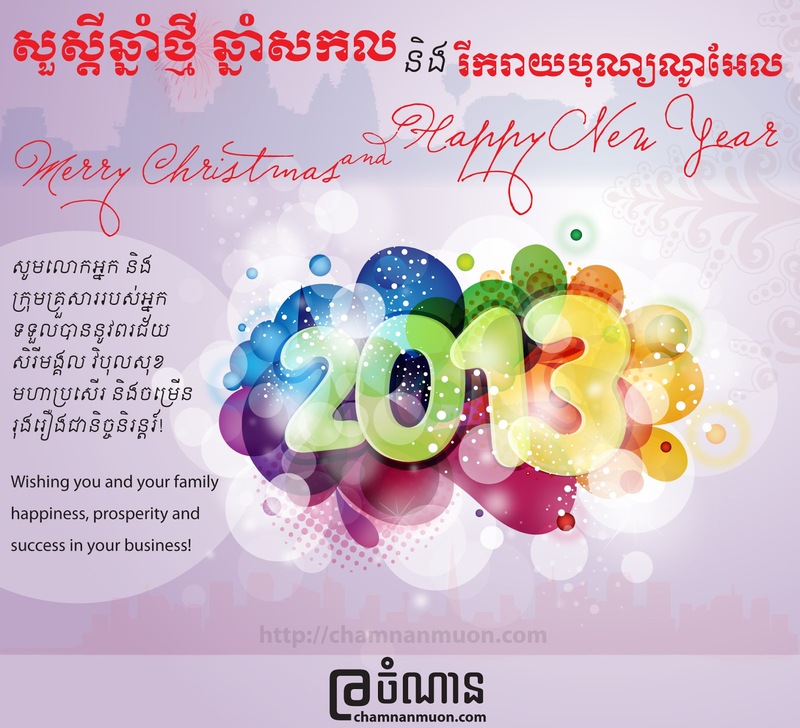 First of all, I would like to say "Merry Christmas and Happy New Year 2013!" to all my families, relatives, friends, colleague, partners, and my readers be blessed with happiness, prosperity, and success in their business. Do you have any plan yet to go visit somewhere for your countdown time on 31.12.12 @11.59pm with your beloved ones? Where to visit during the International New Year Day in Cambodia? Most popular hotels in Cambodia, they provide the new year promotion such as dinner, and cocktail with concert celebration. And some families they prefer to go to visit other resorts or tourism sites in the provinces like Sihanoukville (Kampong Som), it's a popular place to go, this year I heard that the big concert celebration it will be celebrated in Kampot province, Kep city. But in Phnom Penh, they can enjoy the celebration open for the public at Wat Phnom. Please enjoy the lovely time with your sweeties!! 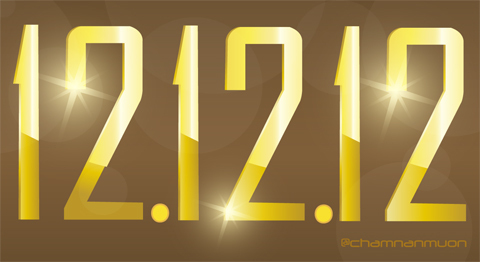 Today is Wednesday 12, December 2012 or 12.12.12, the last "triple date" of the century. Is it an important or special day for you? For me, I think it's just the normal date as usual but it's easy for us to remember it. Some they will think it's a special day, so they will bring their families to eat out at restaurant, .... Anyway, today I also get few wishes from my friends, thanks so much. What happens in Cambodia on this date? "Enjoy Special Bonus on Special Day! Top up min USD1 on 12/12/12 get 120% bonus for on-net uses. Validity period follows top up amount. For Cellcard & Cellcard Niyeay"
"500% Bonus! Top up $1 get 100% and $2 or more get 500% for on-net usage (Call, SMS, Internet) when you top up from 12-14 Dec. Bonus valid for first top up only." These two types of today, 12.12.12, promotion as exampled above in Mobile operator service only. So do you use these two operators (SIM)? If so, please enjoy the promotion together! But please be attention on my bold text in the quote about its validity. I think other operators will do so too :-). As for Facebook users in Cambodia, my friends, most of them also post wishing photos and messages to their friends or families. How about other countries, do they do so? Let's wait and see together or if you know please kindly share it here via posting any comments. Finally, I also wish my families, friends, colleague, and my readers all the best for the whole year through! សូមអនុមោទនា ពិធីបុណ្យកាន់បិណ្ឌ និងភ្ជុំបិណ្ឌ ទាំងអស់គ្នា!! Happy Kan Ben Day and upcoming Pchum Ben Day together!! Happy Pchum Ben Day 2012! Happy New Year Eve 2012!! Let me wish all my family, friends, colleague, classmates, and my valuable readers with Long Life, Good Health, Prosperity, Happiness, and Success in your work and business for New Year 2012. This card is designed for all my valuable blogger readers and other friends in the occasion of Khmer Water Festival 2011; so please our god (Buddha) blesses you all with the best!!! Happy Khmer Water Festival 2011!